NOTE 2: Contact us for special pricing for 5 or 10 user licence. MindView Assistive Technology (AT) software enhances student's ability to visualize, organize and present information. MindView AT sets a new standards for ease-of-use and productivity in the classroom and workplace. MatchWare's involvement in the Assistive Technology market demonstrates a dedication to provide students and professionals affected by reading, writing and learning difficulties with easy-to-use, professional software applications. Mind Mapping plays an important role in the development of students and professionals with learning difficulties. Mind maps have a natural structure that radiates from the center and uses lines, symbols, words, colors and images. Mind mapping turns monotonous information into colorful, memorable and highly organized diagrams that work in line with your brain's natural way of thinking and working. MindView allows for visual graphics, color coordination, reorganization of ideas, and interactive elements such as text documents, website links, videos files and sound files to be included into Mind Maps. MindView AT comes with a simplified user interface showing only the most commonly used commands and features such as inserting branches and attachments, viewing the numbering scheme and exporting to MS Office. This provides a less distracting interface, while allowing users to benefit from the most widely used features in MindView. MindView AT's Quick Start panel provides direct links to dedicated training videos designed to improve users understating of the most important MindView AT features. Users can quickly access videos covering topics such as building the map, exporting to MS Word or PowerPoint, creating references and citations and even time management. See below. Users working with MindView AT's training videos can also download the specific MindView templates which are used in the training videos. This allows for rapid understanding of concepts discussed in the videos and a hands-on learning experience to ensure proper implementation, use and understanding of MindView AT. MindView AT supports the standard High Contrast mode included in Windows and provides new map styles designed specifically to work in that mode. This assists users in identifying important areas of the interface, while minimizing distracting colors, gradients, and more. This further improves the usability of MindView. The ability to have branch text read aloud is a powerful new addition to MindView AT. Whether you are a special needs user or presenting a map in a group setting, the Narrate feature allows you to select a specific branch, text note or comment in the mind map and have MindView read the information aloud. MindView AT is fully integrated with Read&Write 9 GOLD, Texthelp's award-winning assistive software for improving reading and writing skills. Using the two packages together can allow students and professionals to further enhance their learning by using the dictionary, text to speech and screen masking functions. As users type onto their mind map, Read&Write Gold will read their work back to them. The spell checker will not only correct any mistakes by giving dictionary definitions, but users can also benefit from the spelling log which will track patterns in their spelling over time. The ability to output to a sound file allows users to create an audio file of their notes which can be attached to the mind map enhancing understanding and file management. MindView AT has partnered with Nuance's Dragon Naturally Speaking, the world's best-selling speech recognition software. 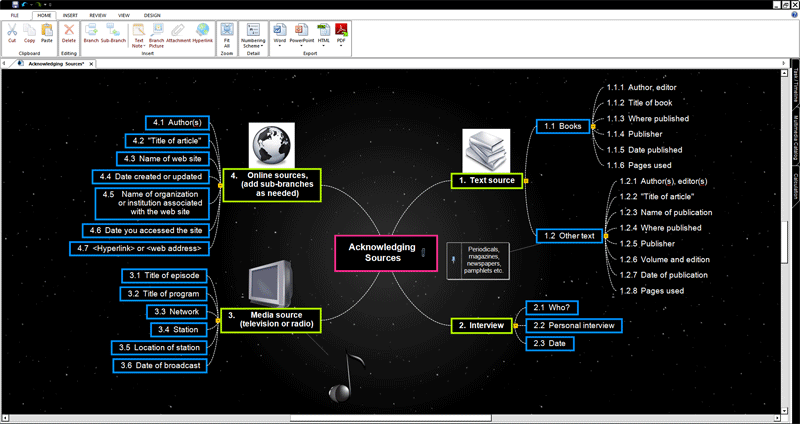 Users can control MindView with simple voice commands for creating and editing branches, navigating the mind map and more. MindView AT sets the MindView document type to Task Management by default. This is designed to assist users in easily creating visual action plans and help those who struggle with managing their time effectively. With a few clicks, users can add due dates and priorities as well as completion levels and person(s) responsible for completing tasks. Combining these features with the organic visual mind map, users are able to overview complex information, or projects while maintaining a simplified visual diagram. MatchWare has streamlined and simplified the popular Citation features in MindView AT. Citations are now included without any field locks, which makes citations update automatically in Word when bibliography styles are changed. This means that users working with the Citation feature in MindView will have better experience when exporting to MS Word for creating research and citation documents such as research papers, book reports and more. Microsoft Word is not required for export/import. Microsoft Word 2007 or newer, Microsoft Word 2000, XP or 2003 with Compatibility Pack, Microsoft WordPad for Windows 7, OpenOffice or other third party Office Open XML viewer/editor. Export/Import to/from Microsoft PowerPoint: Microsoft PowerPoint from 2000 onwards required. Export/Import to/from Microsoft Excel: Microsoft Excel from 2003 onwards required. Export to Microsoft Excel 2010 requires Microsoft .NET Framework 4 Client Profile. Export/Import to/from Microsoft Outlook: Microsoft Outlook from 2000 onwards required. Export/Import to/from Microsoft Project: Microsoft Project from 2003 onwards required for export/import of native Microsoft Project files (.mpp format). Microsoft Project not required for export/import to/from the Microsoft Project XML format. This video shows the basic features of creating and building a mind map, adding content such as text notes and pictures, before customising the look and feel of the mind map. The interface and shortcuts allow students to get their ideas down quickly and will be familiar to anyone with experience of MS Office. Adding content allows the student to break down essays and assignments into more manageable chunks before exporting to word to create the final piece. In this section a student has been writing an essay. They've added pictures for visual reference and text notes as paragraphs. We show the ability to review certain aspects of the document before exporting to a word document. This allows the student to concentrate on the content of the assignment without having to worry about putting together a structured Word essay. The export function from MindView to Word is second to none and will generate a print ready document at the click of a mouse. In this example a student has created a presentation using a mind map, adding pictures and text notes to accompany their ideas for each PowerPoint slide. We show you how to customise the look and feel of the presentation before exporting to a professionally structured PowerPoint document. The ability to generate the presentation using the mind map allows the student to concentrate on the content rather than worrying about the overall structure and look of the presentation. 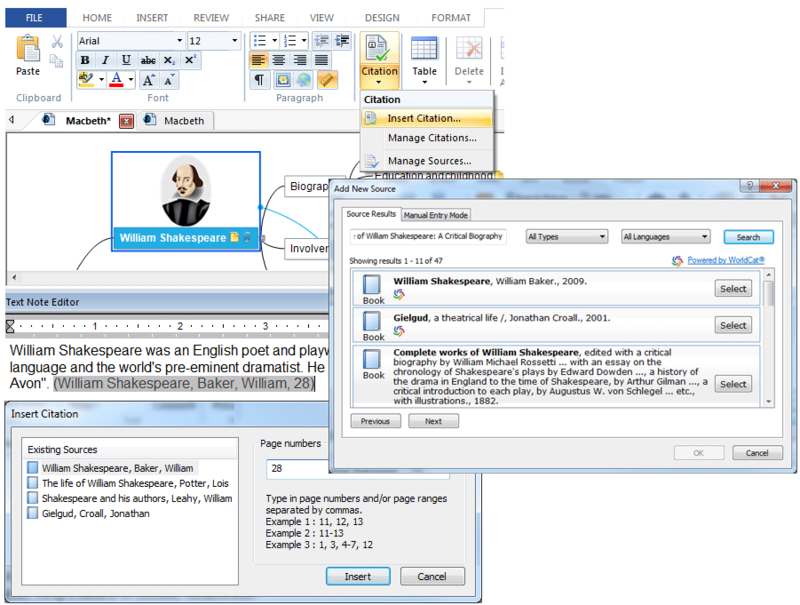 This sections demonstrates a student citing information from a novel using the automatic referencing function within MindView, before exporting to Word and including a pre-generated bibliography. We look at how MindView can speed up, organise and validate the referencing process and make it easier for students to create bibliographies for their assignments. In this example we look at a student's mind map which has been created to show all things that need to be completed within a particular term, including academic and social activities. 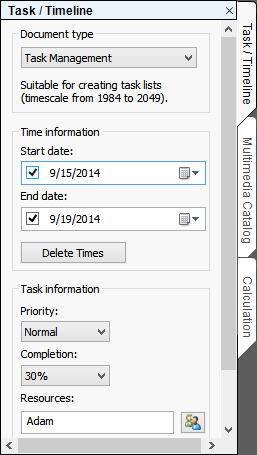 Time is then applied to each activity before switching the view and showing the term in the form of a timeline. This is designed to show how MindView can be used to create visual action plans and help students who struggle with managing their time effectively. In this video we look at how a student has broken down a week's revision into subjects and topics using a mind map. Having previously added time to each topic we then view the mind map as a time line in order to see a revision plan for the week ahead. MindView can be used in this way to help students who struggle with all aspects of organisation, from time management to the organisation of revision notes and files. This example shows how MindView can be used to organise lecture notes, revision and research in one place. We look at attaching different formats of information including files, notes and also hyperlinks to websites. Students can use MindView to help make organising information more manageable, allowing them to keep files and documents within one central location, reducing any stress that may arise from organising files through the standard file/folder system on their PC. Gantt chart capabilities in MindView, showing how to create and build a new project within a mind map before changing the view to a Gantt chart and applying scheduling information. We look at using intuitive drag and drop shortcuts to alter task and time information and apply dependencies to tasks before moving back into the mind map in order to get a visual overview of our project. For any students who are required to study any type of project management during their course MindView gives them a robust and advanced Gantt chart facility whilst keeping the option of generating and reviewing their ideas and tasks in the mind map view. This video shows how MindView's brand new built in predictive text suggestions can help people who struggle with writing and spelling. Powered by TextHelp™, MindView's text prediction will help boost writing confidence for everyone. This videos demonstrates MindView's brand new capture tool, which allows students to quickly capture images and text from websites and documents automatically inserting selected data into the MindView document. If available the capture tool will gather any citation information, carrying across the source and creating a reference. This simplifies the referencing process for students, allowing them to organise and validate their citations more effectively.